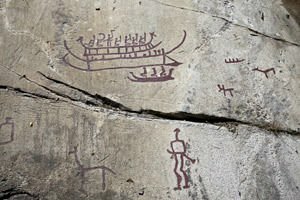 The amazing rock carvings in Tanum represent a unique artistic achievement not only for the rich and varied collection of petroglyphs, but for the ancient and historically dependent unity of images. These unique stone thumbnails are located on the west coast of Sweden, near North Bohuslan, which is located about two hours from Gothenburg. Tanum can be reached by the easiest way to Gothenburg. There some 25 km away you can see these rock paintings, dating from the bronze period of the Stone Age. Miniatures were painted on so called, flat rock that is part of a former fjord, which nowadays is about 25 meters above sea level. Nearly 350 separate and diverse petroglyphs in Tanum are divided broadly into four groups being spread over 25 km of area. Still this is an area which continues to open new and old works. So far, archaeologists have found drawings that represent a total of 13 kinds of shapes and patterns. Most paintings are independent and recreate the shapes of people and animals, weapons, pottery and other objects and vessels, sledges and trees. They all imitate life and beliefs of the people inhabiting the European continent during the Bronze Age. The group of petroglyph, Fosum, differs among other drawings. There are 130 situated shapes combined to each other that never overlap. It reproduces the hunting scenes and moments of everyday life for our ancient ancestors, their customs and beliefs. Depicted are ships with passengers, farmers who treated soil and animal portraits. The rock images in Tanum are part of world heritage of UNESCO, but today the threat to their integrity is quite high. Under the impact of air pollution, climate change and sea salt the rocks are beginning to crack. This envisages the construction of the new road section, which is existing potential danger to the integrity of the rock paintings.